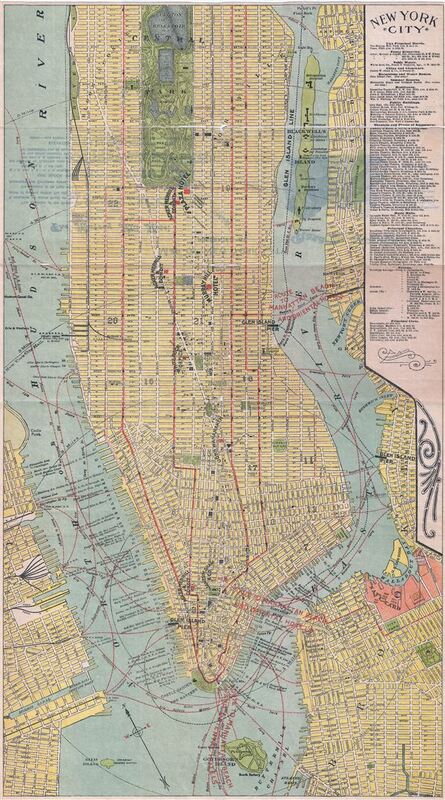 This is a scarce 1894 map or plan of New York City by Geo H. Walker and Company. It covers from 94th street to the Battery and includes parts of Brooklyn and Jersey City. Includes Ellis Island and Governor's Island. Roosevelt Island is here identified as Blackwell's Island. The region is shown in considerable detail and identifies streets, avenues, railways, important buildings, ferry lines, piers, parks and a host of other details. The map, presented by the Plaza Hotel (the original Plaza Hotel was eight stories tall and stood at the site from 1890 - 1905) and the Murray Hill Hotel marks the location of both hotels. An index in the top right quadrant lists clubs, churches, music halls, theatres and places of amusement, public buildings, prominent residences, etc. The map was created by Geo H. Walker and Company and issued by the Plaza Hotel and Murray Hill Hotels. Very good. Some wear and repair along original fold lines, especially near center. Professionally flattened and backed with archival tissue.